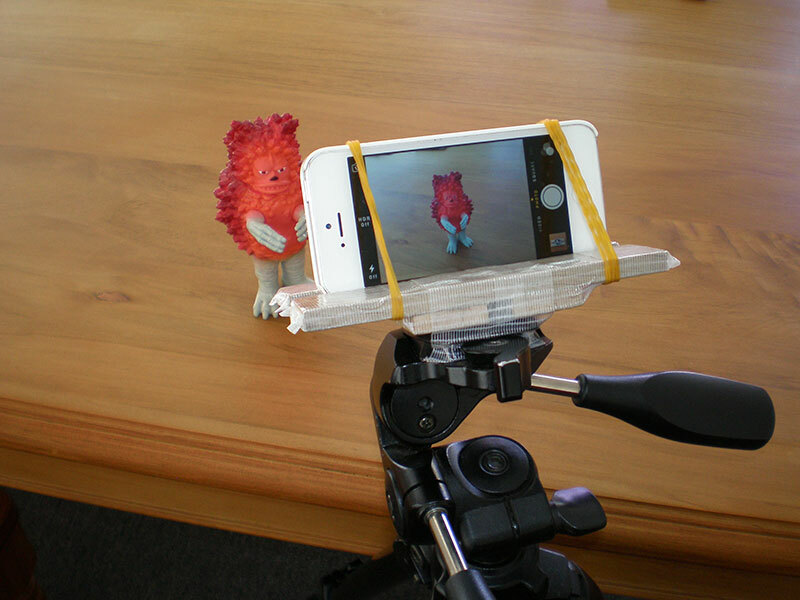 The iPhone tripod mount in action. It’s really hard to take photos of your tripod because you can’t use your tripod. You can get things to attach your phone to your tripod for quite cheap, but the shipping for all the ones I was looking at was a couple of weeks and I needed something sooner than that. I’ve tried taping my phone to my tripod before, but to get it secure enough you end up having tape covering the screen on the phone so you can’t compose the shot properly. This is what I came up with and I’m in amazed at how well it works. None of the screen is covered over and it’s secure enough that I can tip the tripod head up so it can go into portrait view as well. 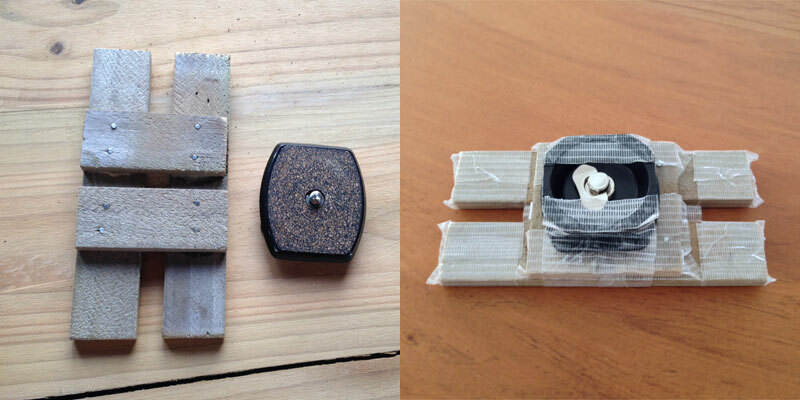 Left: The bits of wood are glued and nailed together. Right: The whole thing is covered over with duct tape and the tripod plate is taped onto the bottom of it. The wood I used was old trellis. The gap between the two long bits is the slot where the phone sits and the gap between the shorter joining bits is where the screw from the tripod plate goes. Once they were attached I covered over it in duct tape. Partly to stop it scratching my phone and also because the nails I used were way too long so I had to bend them over and they were a little dangerous. The tripod plate is taped to the bottom of the mount. Once that’s clipped into the tripod you can put the phone in and use rubber bands to hold it on (see the photo at the top of this post). The downside of this is that you need to tape it to the tripod plate every time you want to use it, but it was just meant to be a quick solution where I didn’t have to go and buy anything. If you wanted to make one that was more reusable you could fit it with a socket like the one on the bottom of cameras. You can buy ones that are made for tripods so they have the right thread, I bought one years ago but I can’t remember where from. It was in pre-online shopping times, when you had to go to actual shops to get things.